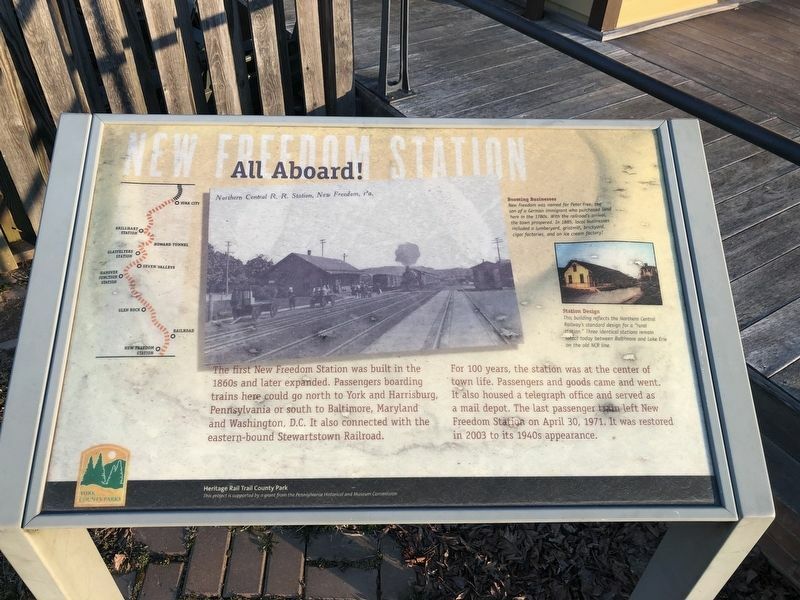 The first New Freedom Station was built in the 1860s and later expanded. Passengers boarding trains here could go north to York and Harrisburg, Pennsylvania or south to Baltimore, Maryland and Washington, D.C. 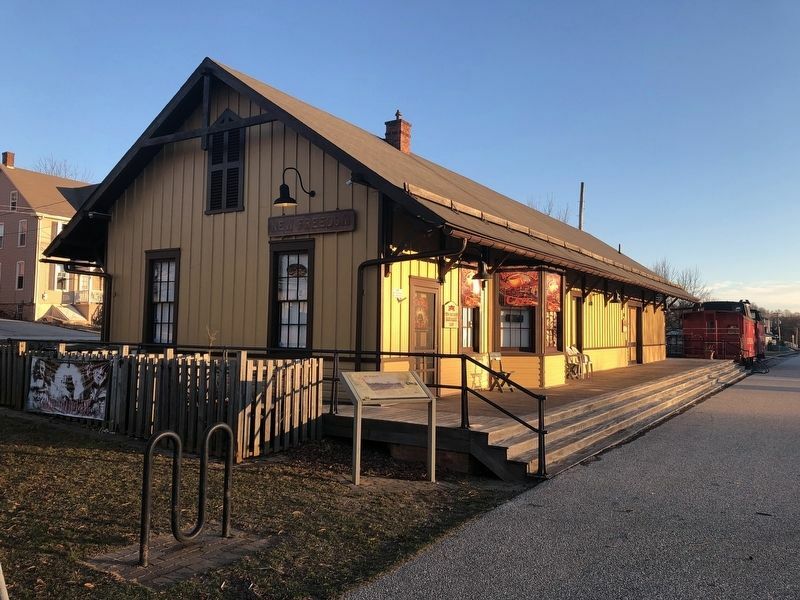 It also connected with the eastern-bound Stewartstown Railroad. For 100 years, the station was at the center of town life. Passengers and goods came and went. It also housed a telegraph office and served as a mail depot. The last passenger train left New Freedom Station on April 30, 1971. It was restored in 2003 to its 1940s appearance. 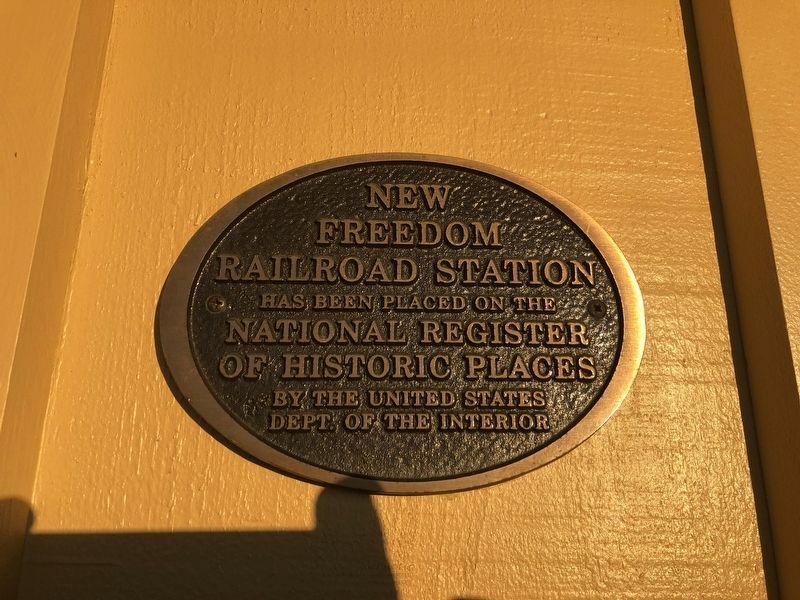 Northern Central R. R. Station, New Freedom, Pa.
New Freedom was named for Peter Free, the son of a German immigrant who purchased land here in the 1780s. With the railroad's arrival, the town prospered. In 1885, local businesses included a lumberyard, gristmill, brickyard, cigar factories, and an ice cream factory! and Lake Erie on the old NCR line. Location. 39° 44.399′ N, 76° 42.04′ W. Marker is in New Freedom, Pennsylvania, in York County. Marker is on North Front Street south of Maple Alley, on the right when traveling north. Touch for map. Marker is at or near this postal address: 117 North Front Street, New Freedom PA 17349, United States of America. Touch for directions. Other nearby markers. At least 8 other markers are within 3 miles of this marker, measured as the crow flies. Homes on Wheels, Mobile Offices (within shouting distance of this marker); The Farmer's Town (about 300 feet away, measured in a direct line); Summit Grove (approx. half a mile away); Spurgeon Milton Keeny (approx. 2.1 miles away); Amanda Berry Smith (1837-1915) (approx. 2.2 miles away); Freeland (approx. 2½ miles away in Maryland); Mason and Dixon Line (approx. 2.6 miles away in Maryland); Mason and Dixon Mile Stone (approx. 2.6 miles away in Maryland). Touch for a list and map of all markers in New Freedom. Credits. This page was last revised on March 23, 2019. This page originally submitted on March 23, 2019, by Devry Becker Jones of Washington, District of Columbia. This page has been viewed 101 times since then. Photos: 1, 2, 3. submitted on March 23, 2019, by Devry Becker Jones of Washington, District of Columbia.